the organisation of workshops, with tutors who may be sourced within Borderline, or from afar. Often these are open to the public. 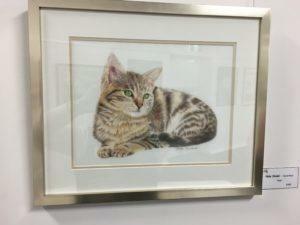 Just a small selection from our July exhibition at Inverell Art Gallery…. 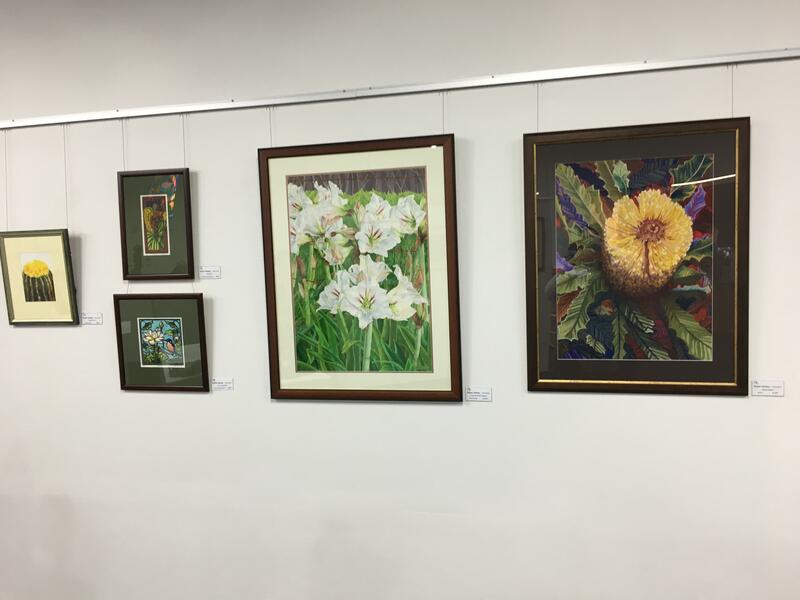 So exciting to see our members work being prepared for our exhibition “On The Move” in Inverell – opening at the Galery on June 30th and continuing to August 3rd. 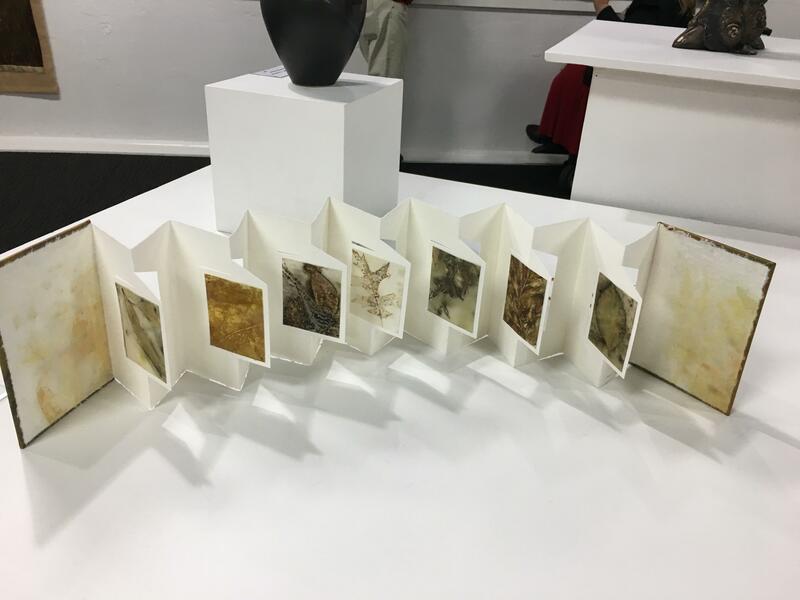 from Liz Powell – one of 3 tunnel books that she will be exhibiting (left). 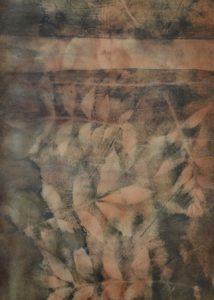 and from Jayne Barrett a work in progress – eco print hanging in wool (below). 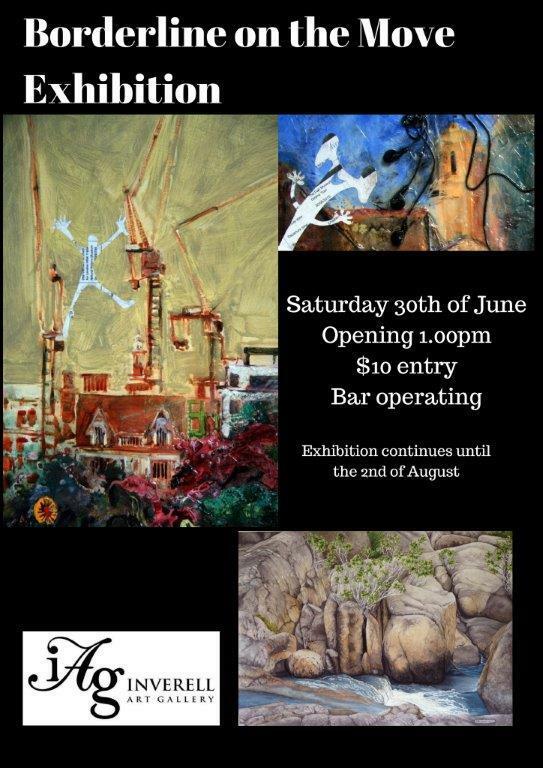 Note : Large works and 3D to be delivered to Inverell by artist. Saturday 30 June: 1.00pm Exhibition Opens. $10-15 for lunch (to be decided) A bus may be organized for transport. 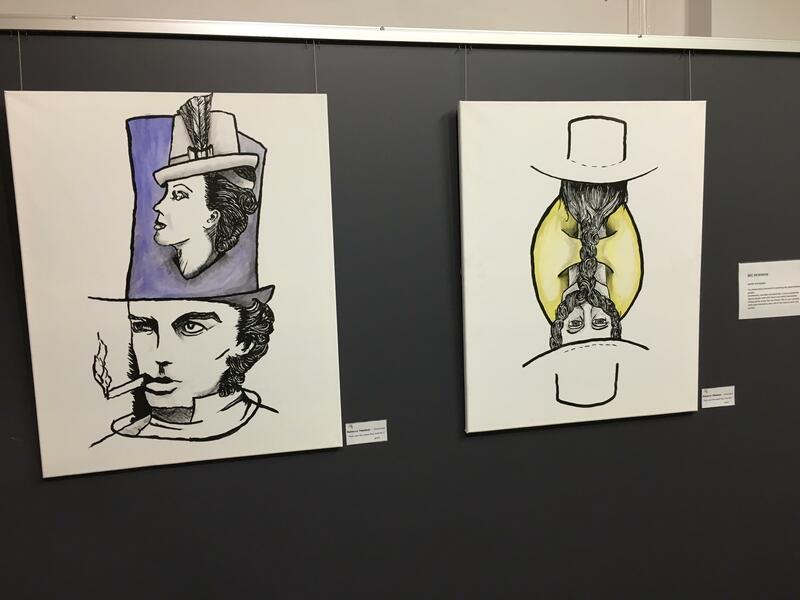 The art year is starting off with a number of local events where our member’s amazing work can be seen …. 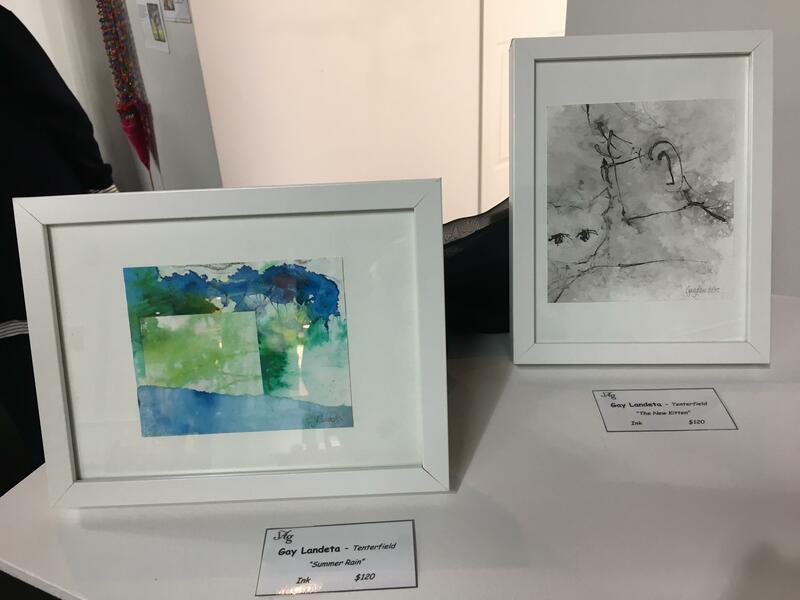 LAF Out Loud – Local Art Fest (part of the Apple And Grape Festival) – Feb 22 to April 1st : entries due Feb 13 – 17th. Uralla Rotary Club 41st Annual Art Exhibition – 17th to 25th of March, opening night Friday the 16th : entries due Feb 23rd. NB Members – all entry forms are available via the links or see the January Borderline minutes for more information (via your email). Bring a picnic to share and your drawing, painting or other art materials … Come and Play!!! Watch this space for Borderlines next gallery showing … more details to follow. Borderline Christmas Party on 4th December was a very pleasant lunch at Jennings Hotel. Sue Jurd will be hosting a Borderline sponsored workshop on Batik 1/12/2017. Sorry, the workshop is fully booked. Borderline sponsored workshop: ‘Art Matters’ with Nicole Sylvestre – bookings being taken now for 10 September 2016 – go to the Workshops page for further information. Drawing: from the Expected to the Unexpected uses a combination of observational drawing and intuition. The workshop will explore contemporary drawing processes, as well as develop an awareness and broader understanding of drawing. You will experiment with many techniques: with pencil, charcoal, ink, wax, masking tape & wet/dry paper. The drawings will be evocative, sustain your looking and bring out the poet in you, helping each student to find their own language. Sheryl Wright hosted a Borderline sponsored workshop on Felting. 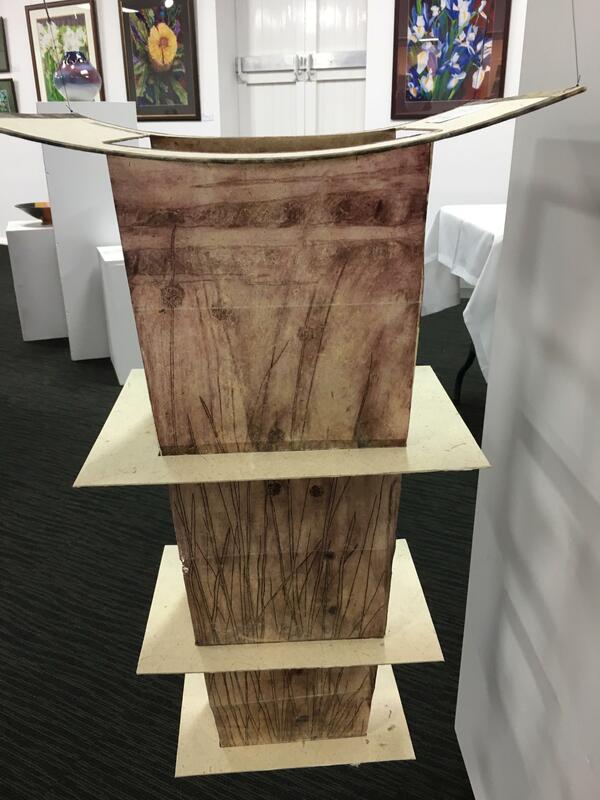 Jayne Barrett hosted a Borderline sponsored workshop on Papermaking on Saturday 28 May 2016. Our SRAG exhibition ‘Resonance’ is now on, until 24 Oct 2015. Click here for images from the Resonance Opening night. There will be an artist talk for U3A on Thursday 15 Oct at 10:30. There is a printing day being organised for Friday 31 July at the Tennis Club. Interested people please contact Sue or Nola, and come and learn about our new press. Beginners packs containing paper, ink, acetate sheet, tarlatan may be available for purchase. Borderline has purchased a geared printing press with a maximum print area of 30.5cm x 63.5cm. 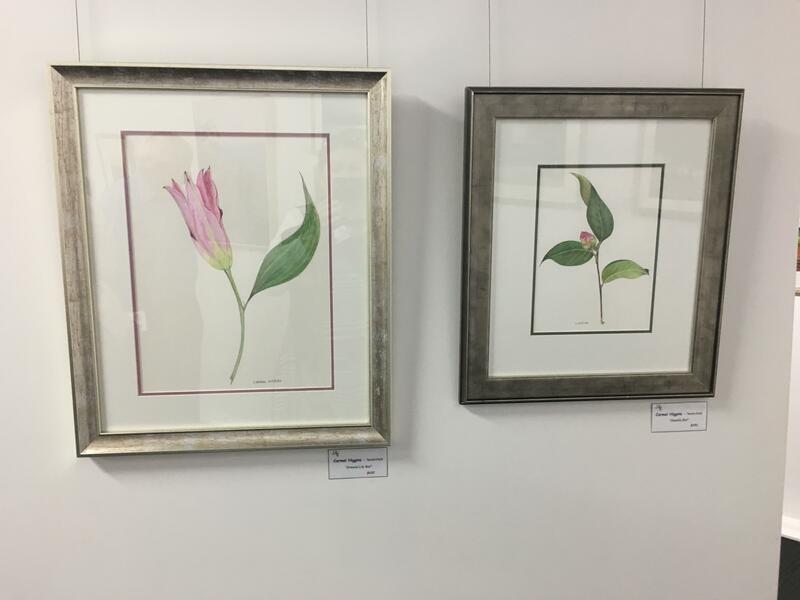 The press will be be up and running for the Tenterfield Traveller print workshop in May, and will be available for weekly hire by members after that date. Details about hiring are available from the members page. Artist in residency Tenterfield Traveller 2015 workshops with Christine Porter, Lindsay Hunt, and Jayne Barrett ran from May 25 to May31. 22 November 2014 Borderline’s Christmas party, generously hosted by Sue Jurd was a latex gloved hands on day experimenting with various paper embellishing techniques, including monoprinting, texturing with glue, marbling, spraying, rusting, shellac with charcoal. What a great lead into Jayne Barrett’s next bookmaking workshop (TBA soon!). August 23/24 2014 – Read about the Blacksmithing and Welding Workshop at Fire & Stone, Tabulam. 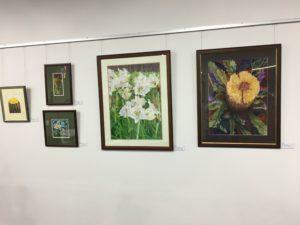 24 Oct 2014 – Excursion to Tweed River Gallery to see Margaret Olley’s reconstructed studio. Transport is via shared car. Expression of interest forms have been emailed to members. 2 July 2014 – NERAM tour, Armidale. Transport is via shared cars – $10 for petrol. Expression of interest forms have been emailed to members. 19/20 June 2014 – Borderline is hosting a Bookmaking Workshop with Borderliner Jayne Barrett. Expression of interest forms have been emailed to members. Non-members should contact Borderline. 17 Feb 2014 – Seniors’ Week, Tenterfield, 17 March 2014, beginning 10.00am at the Golf Club. 6 Borderline members will be demonstrating throughout the day: John Donnelly, Sue Jurd, Shirley Caldwell, Nola Sindel, Pam Docherty, Chris Hangan. 17 Feb 2014 – Borderline is investigating organising a weekend at Fire and Stone Sculpture Park, Tabulum. Members can see the newsletter for more details. The weekend may include a 1 or 2 day workshop with Michael Taylor, and a blacksmithing workshop with Jim Grasby and Keith Cameron. Sue Jurd is investigating. 17 Feb 2014 – Artworks on Davadi has offered to host a Borderline exhibition from 6 May 2014 to 31 July. Borderliner Judy Pidgeon will coordinate. Tenterfield Traveller 2014 plans are underway for the period 13 June – 22 June 2014. The sub-committee consists of Sue Jurd, Shirley Caldwell, and Gail Galloway. 21 Dec 2013 – Borderline’s 2013 Christmas party plans are underway – we’ll spend a day of fabric dyeing at Sue Jurd’s. Bring lunch to share! See the newsletter for more details. 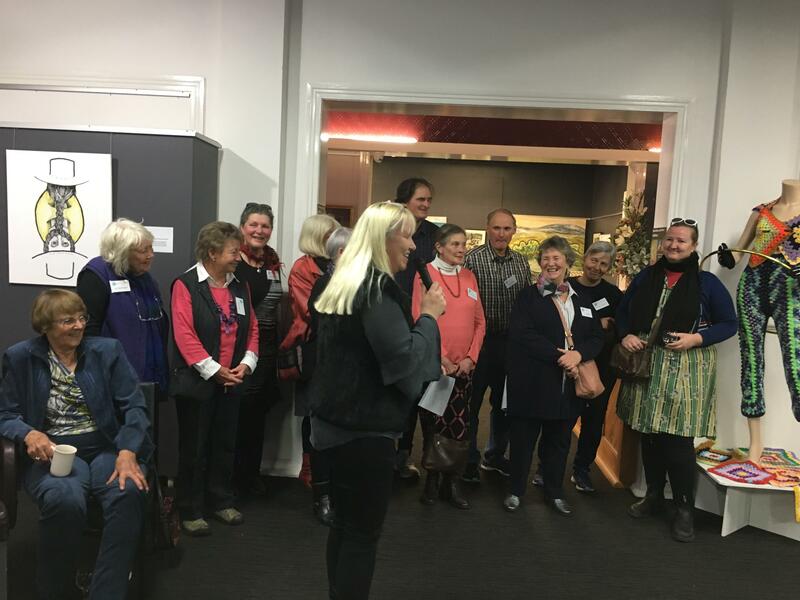 15 June 2013 – 22 June 2013 Borderline’s Tenterfield Traveller’s program was a great success, and is being considered for a future format. Many thanks to Artist in Residency Christine Porter. 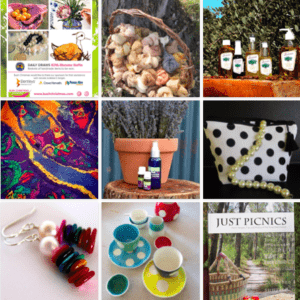 Click on Tenterfield Traveller for more details. 15 Dec 2012 Borderline’s Christmas Party day. Sue Jurd is keeping the agenda is a surprise, however expect some travelling between venues, and a Christmas lunch. Borderliners and their family members are welcome. 23 June 2012 Borderline’s float in Tenterfield’s 2012 Wintersong street parade was a real eye catcher. Not only was the van itself painted with artistic gusto, but it was also adorned with rolls of canvas, easels, palettes and paint brushes, how-to books, streamers, balloons, and even finished art works! Thanks to Chris and Tony Hanagan for making their van available and the effort involved with making it look “awesome”. Congratulations Borderline for winning ‘Best Float’ in the parade! Check it out at Wintersong parade 2012. 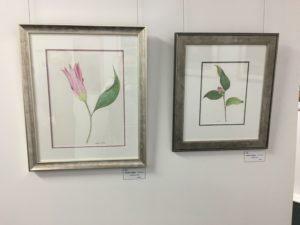 3 June 2012 – 3 July 2012 Borderline exhibition ‘Artsong‘ at the Forest to Furniture Gallery, Tenterfield,was held to coincide with Tenterfield’s Wintersong carnival. 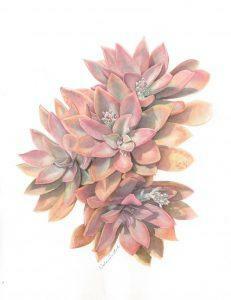 31 Mar 2012 – 2 May 2012 Borderline exhibition ‘Shine:enihS’ at the Texas Art Gallery. 17 Dec 2011 Borderline’s ‘Paint Pot and Print’ Christmas Fun Day. A fabulous Day spent at Graeme Schreiber’s Bush Rock Gallery and Eva and Bent Rasmussens pottery and print studios, capped off by a wonderful Christmas spread at the Jennings Hotel. 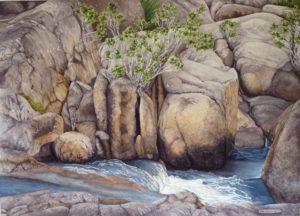 26 Aug 2011 – 02 Oct 2011 ‘State of Flux’ members’ exhibition at the Stanthorpe Regional Art Gallery. The members of Borderline have taken up the challenge of addressing the fascinating theme of flux. 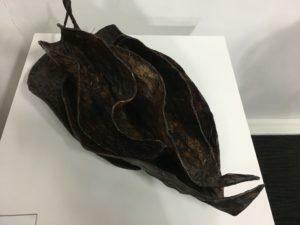 Although this exhibition is now closed, you can see read about it, and view images from the opening night by clicking State of Flux. 02 Sep 2011 Presentation of an etching collage created for Millrace Aged Hostel by Borderline, using prints created by the public under the guidence of Borderline. Click on Millrace for more information, and an image taken at the presentation. 08 Oct 2011 – 04 Nov 2011 ‘Shine‘ members’ exhibition at the Glen Innes Art Gallery. Allowing artistic talent to ‘Shine’. 22 Oct 2011 Borderline members were available at the Tenterfield Showground ‘Showing Off’ Family Fun Day to answer any queries about the presentation requirements for art work at the Tenterfield Show. For anyone who did not attend, please make sure that any 2D artwork being entered for the show is presented ready for hanging on a hook. It is sufficient to have a string or wire suited to the weight of the work, firmly secured across the back. Art works need not be framed, however they must be well supported (able to withstand potential breezy gusts from nearby doors), and in the case of 2D works, well secured to their hanging device. 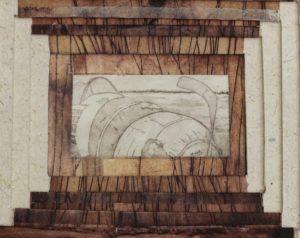 A work on paper for example need not be behind glass, however it must be secured to a supportive and hangable backing. Last year the art stewards were contending with pictures which were falling out of cheap frames, or had strings attached to canvas backs with loose drawing pins. These are unacceptable. The next Tenterfield show is 27/28/29 January 2012. The show schedule is not out yet, but it will reveal a revamp of entry categories in the art sections.